Purchase a dimmer. I got a regular 'toggler' style, because I didn't want to replace our new wallplate/switchplate cover. TURN OFF POWER. 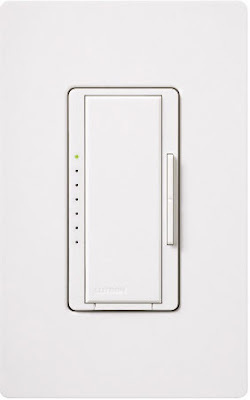 Remove pretty wallplate cover (or buy new pretty wallplate cover!) and make a note to touch up paint around door trim. Unscrew crusty switch with years of nail fungus imbedded in the 'OFF' and 'ON' letters. Notice that you painted around the original (ugly) wallplate cover and chuckle to yourself. Unwrap electrical tape, if any. Notice how your switch is attached to the wires, take a picture if you won't remember. Or if you want to document the process on your blog. Either way. My switch and electrical box were very simple to figure out, I had a red wire on the bottom, and a black wire on top. Nothing else going on whatsoever. Unscrew the wires. Laugh at how funny the wires look just hanging out there. I was alone on a Saturday, I was easily entertained! Follow the directions on your dimmer for where the wires should go. You can either insert the wires into the dimmer, or wrap the wires around screws. I had copper wires wrapped around screws on the old switch, so that is how it was recommended to attach the new one. This part is tricky, it took me a few tries to make it work because I hadn't wrapped them tight enough. Use a needlenose pliers or other tool if necessary to get them wound tightly and then tighten the screw. I put the black wire on the left and the red wire on the right side of the dimmer, following the instructions. Tighten screws fully. Once you've got the light working, you can put your lovely wallplate cover back on. YAY! Now stand around the light switch playing with the dimmer function for at least 5 minutes. The switch needs to be warmed up, right? Also, don't tell hubby that you installed a dimmer and see if he thinks you changed out the bulbs or is going blind! Our wallplate covers throughout the house are available at Home Depot, however Menards has them for only $4 - $5, so I got them all there instead. The dimmer I purchased is for either a single pole (single switch) or a 3-way (haha) switch. 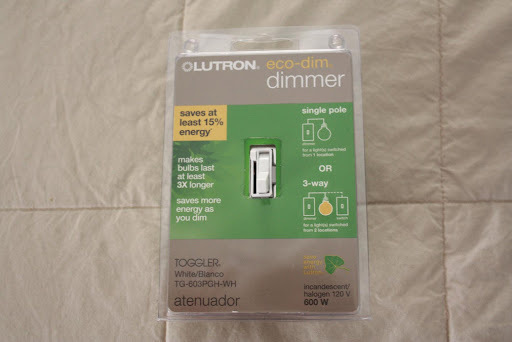 I could've just gotten a single pole dimmer, but the three-way one was on sale for $2 less than the (normally cheaper) single one, so that's the one I took home for $13. Just be aware which one you are buying! Thankyou! Were going to put a dimmer in our Bedroom - and I was crossing fingers it would be an easy DIY project. Yay! This couldn't have come at a better time- just installed a new chandelier in the dining room and with 5 bulbs (even all 40 watt) it is way too bright and is making me hate the paint color. I'm totally going to DIY, no, wait, MMHDI (make my hubby do it) this weekend! Hehe this made me chuckle - it's not a home improvement project in our home if there are no thrown tools or yelled profanities. ;) I LOVE your wallplate! 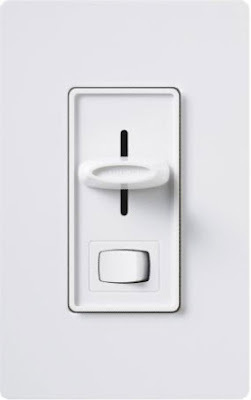 It's just perfect for the bedroom and this is a great tutorial on installing a dimmer. I just used the pathetic instructions that came in the packaging and am thankful I didn't kill anyone! You ARE handy! Yet another tutorial I will be bookmarking for future reference! I must admit, I have dimmers on just about every switch in my house and I consider it a 'lifestyle' choice. I have sensitive eyes, and newly appearing wrinkles, therefore I declare that every fixture in my house shall have the option to be dimly lit. I'm convinced I look better, and see better, in low light. Call me crazy. Great tutorial, girlfriend. BTW, your blingy bling chandy is awesome ! Oooh- I do love that switchplate cover. Hahaha "no I will not elaborate". Thanks for the informative post! Sara ... thanks for checking up on me. I've been laid low with near pneumonia and have done nothing, nada, zip ... not looked at blogs, posted anything or done any home improvements! I'm almost back in the swing of things now.